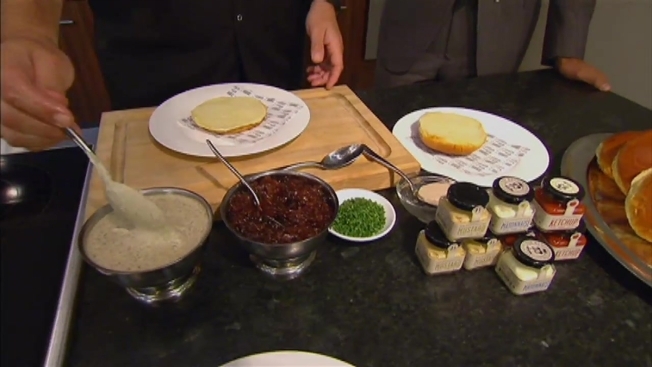 Chef Doug Psaltis of RPM Steak visited NBC's Cafe 5 to show us how to make the RPM truffle burger. Find the recipe below. 2. Season patties with salt and pepper. 3. In a hot cast-iron pan, add the canola oil and butter to melt. Add patties and sear 2 to 3 minutes on one side. Carefully turn over and cook for another two minutes. 4. Toast the brioche buns. 5. Spread truffle aioli on bottom of toasted buns. 6. Place a beef patty onto each bun. Top the burgers with foie gras butter. 7. Serve burgers with red onion jam alongside. 1. In a small saucepan over medium-low heat, cook the red onion with the oil until translucent and soft (being careful not to brown). 2. Add red wine vinegar, sugar and water. 3. Continue cooking over medium-low heat until the liquid has thickened and the mixture has a jam-like consistency. Let cool. 1. Add foie gras pate and butter to the bowl of a standing mixer. (If using foie gras mousse, omit the butter.) Using the paddle attachment beat until well incorporated and smooth. Season to taste with salt. 2. Chill foie gras butter until ready to use. 2. Chill until ready to use.